NB: All elements (excluding .tbe audio files) can be dragged and dropped from your computer onto the media library. 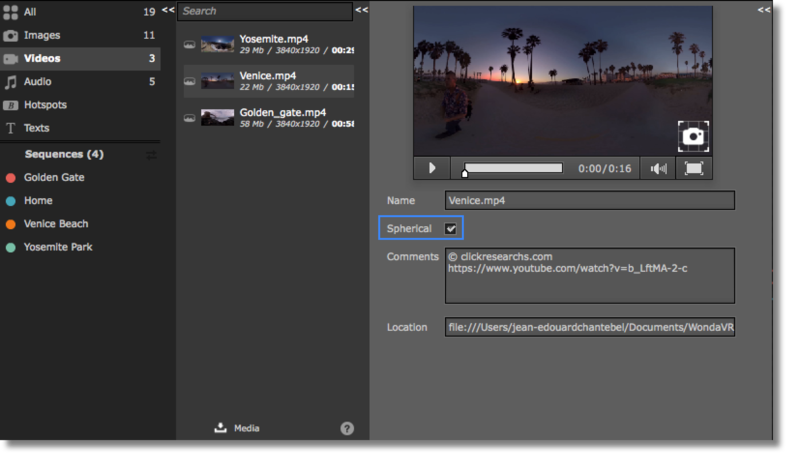 To import 360° photos and videos, just drag and drop your media files onto the medialibrary panel as shown below. If the media files you have imported are in equirectangular format, a confirmation message will appear. By confirming this message, Wonda VR will consider it as a 360° media and a dedicated icon will be added next to the media name and the “spherical” box will be checked in your medialibrary. You can also tick it manually if necessary.